Excessive and inappropriate antibiotic use contributes to growing antibiotic resistance, an important public-health problem. Strategies must be developed to improve antibiotic-prescribing. Our purpose is to review of educational programs aimed at improving antibiotic-prescribing by physicians and/or antibiotic-dispensing by pharmacists, in both primary-care and hospital settings. We conducted a critical systematic search and review of the relevant literature on educational programs aimed at improving antibiotic prescribing and dispensing practice in primary-care and hospital settings, published in January 2001 through December 2011. We identified 78 studies for analysis, 47 in primary-care and 31 in hospital settings. The studies differed widely in design but mostly reported positive results. Outcomes measured in the reviewed studies were adherence to guidelines, total of antibiotics prescribed, or both, attitudes and behavior related to antibiotic prescribing and quality of pharmacy practice related to antibiotics. Twenty-nine studies (62%) in primary care and twenty-four (78%) in hospital setting reported positive results for all measured outcomes; fourteen studies (30%) in primary care and six (20%) in hospital setting reported positive results for some outcomes and results that were not statistically influenced by the intervention for others; only four studies in primary care and one study in hospital setting failed to report significant post-intervention improvements for all outcomes. Improvement in adherence to guidelines and decrease of total of antibiotics prescribed, after educational interventions, were observed, respectively, in 46% and 41% of all the reviewed studies. Changes in behaviour related to antibiotic-prescribing and improvement in quality of pharmacy practice was observed, respectively, in four studies and one study respectively. The results show that antibiotic use could be improved by educational interventions, being mostly used multifaceted interventions. Antibiotic resistance is an important public-health issue, which is aggravated by the lack of new antimicrobial agents [1, 2]. Inappropriate use of antibiotics is the main factor underlying microbial resistance [3, 4]. Ecological studies in Europe suggest that there is a clear association between extent of antibiotic use and rate of resistance . Excessive and inappropriate use of antibiotics is attributed to misprescription and to self-medication with “leftovers” from previous courses or with antibiotics dispensed in pharmacies without prescription [6, 7]. In countries with a high incidence of self-medication with antibiotics, prescription of antibiotics is also high , suggesting that both practices are subject to the same cultural factors . Physicians and pharmacists are the health professionals who exert most influence on patients’ medication-related behavior. Many educational interventions to improve antibiotic-prescribing and/or dispensing have targeted those health professionals. Previous systematic reviews of the topic include Steinman’s , which covered reports published prior to 2004 and on interventions directed at physicians. Other more recent reviews [10–13] have targeted specific areas, namely, respiratory tract infections [10, 13], critical care , and acute care . Therefore, there has been no general reviews, of the topic, including interventions on physicians a pharmacists to improve antibiotic prescription and dispensing. To close this gap, we carried out a critical review of educational programs aimed at improving antibiotic-prescribing by physicians and/or antibiotic-dispensing by pharmacists, in both primary-care and hospital settings. For review purposes, we conducted a search of the MEDLINE-PubMED scientific database from January 2001 through December 2011. In addition, other papers were located by manual searches targeting journals, particularly those less likely to be indexed, and references cited by papers retrieved. The search strategy was designed to identify relevant studies addressing antibiotic resistance and the prescribing/dispensing habits of health care providers (physicians and pharmacists) pre- and post-educational interventions. The following search terms and their equivalents were used in PubMed: (“intervention” OR “program” OR “health promotion” OR “education”) AND (“pharmacists” OR “pharmacy” OR “physician” OR “health professionals” OR “clinician” OR “clinic” OR “practitioner” OR “general practitioner” OR “doctor”) AND (“antibiotics” OR “antimicrobial”). Based on previous reviews [14–17], we apply this selection criteria: (i) language: papers had to be published in English, French, Spanish or Portuguese; (ii) type of intervention: studies had to describe educational interventions; (iii) target population: educational interventions had to target physicians (general practitioners and all specialties) and/or pharmacists (population studies were included only if they also included interventions on pharmacists and/or physicians); and (iv) outcome measures: studies had to measure the effect of educational interventions on the prescribing behavior of physicians and/or dispensing behavior of pharmacists. Insofar as study design was concerned, no inclusion or exclusion criteria were stipulated because our aim was to use quality methodology to conduct a critical review of all published studies. Adapted from Figueiras , study designs were classified as follows: (1) before/after study; (2) non-randomized controlled study without cross-contamination control; (3) non-randomized controlled study with cross-contamination control; (4) randomized controlled study without cross-contamination control; and (5) randomized controlled study without cross-contamination control. Where authors reported the different groups as being in workplaces that were geographically far apart, the study was deemed to have cross-contamination control; and where no mention was made of distance between groups or specific implementation of cross-contamination control, the study was deemed to be without such control. In cases where studies identified specific diseases in which interventions were made to improve antibiotic use, this was recorded. Educational interventions include any attempt to persuade physicians to modify their practice performance by communicating clinical information strategies  and by communication skills training . Strategies that were purely administrative or applied incentives or coercion were excluded from this definition of educational interventions. In our review, we only included studies that assessed educational interventions. However, in studies in which these types of interventions were associated with others, we extracted data on all strategies. Consequently, interventions were classified into the following categories, adapted from Davis  and Figueiras : (1) dissemination of printed/audiovisual educational materials (mailed printed matter; protocols and guidelines; self-instruction materials; drug bulletins); (2) group education, including group-session rounds, conferences, lectures, seminars, and tutorials; (3) feedback of physician prescribing patterns (individually, or including a comparison between these patterns and peer behavior and/or accepted standards), or feedback of patient-specific lists of prescribed medication; (4) individual outreach visits; (5) reminders at the time of prescribing; (6) computer-assisted decision-making systems; (7) formulary control/restrictive formulary process; (8) patient education (pamphlets); (9) patient education (videotapes); (10) workshops on rapid tests/introduction of Rapid Antigen Detection Testing (RADT) in consulting offices; (11) enforcement of regulations; (12) prescription feedback, with recommendations to modify it made by pharmacists and/or infectious-disease physicians; (13) financial incentives. Under this head, we included the period during which outcomes were measured (baseline, intervention period and follow-up). Studies were classified into different categories, namely: (1) comparison of post-intervention values between groups; (2) comparison of pre- and post-intervention values within each group; (3) comparison of pre- and post-intervention values between groups; (4) comparison of follow-up values between groups; (5) comparison of pre-, post, and follow-up values within each group; and, (6) comparison of pre-, post- and follow-up values between groups. We collected data yielded by statistical tests used to assess the effectiveness of interventions. The results extracted from studies consisted of changes in: total antibiotics prescribed/dispensed (T); choice of appropriate antibiotics/adherence to antibiotic guidance according to guideline algorithms, including dosages and administration routes (Ga); attitudes and behavior (At/Bh); quality of pharmacy practice (Qph). Study results were classified as: positive (+), if reported as positive or if changes in outcomes measured were statistically significant; partially positive (±), if reported as positive for some variables and negative for others; and negative (−), if reported as negative. Identification and inclusion of studies. In the studies analyzed (Table 1), educational interventions in primary care mainly targeted physicians, and outcomes were assessed by reference to the total antibiotic prescription or appropriate antibiotic prescription rates. Educational interventions in pharmacists occurred in 8 studies [25, 32, 33, 42, 44, 50, 52, 66], though in 6 cases the interventions covered both pharmacists and physicians. In 21 studies [20, 22, 23, 25, 31–33, 35–37, 39, 43, 45, 46, 50–53, 55, 57, 60], the interventions were extended to patients and their caregivers or general population. (a) PC – primary care; HC – hospital care. (b) GPs – general practitioners; Ps – pediatrics; Py – physicians; Pa – patients or their caregivers; Ph – pharmacists; Nu – nurses; O – others. (c) CG – control group; IG – intervention group. In primary care (table 2), 33 studies (70%) [20–24, 26, 27, 29, 30, 32–39, 41, 44, 45, 47, 48, 50, 51, 53, 54, 56, 58–61, 63, 65] focused on the use of antibiotics in respiratory infections, and one focused on the use of antibiotics in infectious diseases and other infections (urinary infections, skin and soft tissue infections and septicemia) ; the remaining 30% failed to identify any target disease [25, 28, 31, 40, 42, 43, 46, 49, 52, 55, 57, 62, 64, 66]. Of the 47 papers, 27 (57%) studied the efficacy/effectiveness of one or more interventions versus non-intervention, using a control group that received the intervention in four studies, dissemination of guideline information in three [56, 57, 65] and educational sessions on diagnosis of otitis media in one . In this last study, the educational session in the intervention group included diagnosis of otitis media and information on recommendations for antibiotic use. a In, significantly positive in post-intervention period but no significant change post-follow-up. b In, while prescriptions for pharyngitis, otitis media and URTI decreased significantly post-intervention, the decrease in the case of bronchitis was not as significant. c In, comparison between attitudes, knowledge and behavior of physicians in the intervention versus the control group showed no significant differences. Physicians in the intervention group reported that they had changed their prescribing in the preceding 3 years. d In, after one year, there was a reduction in the percentage of antibiotic prescribing in the intervention group but this was not statistically different from the control group. e In, interventions resulted in improved antibiotic use, which was statistically significant in the Hanoi but not in the Bangkok study. f In, there was no significant decrease in one age group (3–24 months). g In, the reduction in antibiotic prescribing by pediatricians was greater in the control than in the intervention group. h In, audit and feedback combined with academic detailing or seminars appeared to be more effective in changing antibiotic prescribing practices than audit and feedback alone. i In, there was a moderate decrease in total antibiotics prescribed but this was not statistically significant. j In, appropriate antibiotic prescribing improved post-intervention but did not prove statistically significant. k In, the prescribing rate decreased in all groups but there were no statistically significant differences between groups. L In, adherence was high though not statistically significant in the intervention group, but, in second episodes there were no differences in adherence, between groups. m In, utilization rates for acute bronchitis are at the same level as when intervention began, but other acute respiratory tract infections declined. (a) Disease: URTI – upper respiratory tract infections; RTI – respiratory tract infections; ARTI – acute respiratory tract infections; UTI – urinary tract infections. (b) Study design (SD): (1) before/after studies; (2) – nonrandomized controlled trial without cross-contamination control; (3) – nonrandomized controlled trial with cross-contamination control; (4) - randomized controlled trial without cross-contamination control; (5) - randomized controlled trial with cross-contamination control. (c) IG – intervention group; CG – control group. (d) Type of intervention (TI): (0) no intervention; (1) dissemination of printed/audiovisual educational materials (mailed printed matter; protocols and guidelines; self-instruction materials; drug bulletins); (2) group education, including group-session rounds, conferences, lectures, seminars and tutorials; (3) feedback of physician prescribing patterns (individually or including a comparison of these patterns with peer behavior and/or accepted standards) or feedback of patient-specific lists of prescribed medication; (4) individual outreach visits; (5) reminders at the time of prescribing; (6) computer-assisted decision-making systems; (7) formulary-control/restrictive formulary process; (8) patient education (pamphlets); (9) patient education (videotapes); (10) workshops on rapid tests / introduction of Rapid Antigen Detection Tests (RADTs) in consulting offices; (11) enforcement of regulations; (12) prescription feedback with recommendations to modify it by pharmacists and/or infectious-disease physicians; (13) financial incentives. (e) Type of data-analysis (T): (1) comparison of post-test values between groups; (2) comparison of pre- and post-values within each group; (3) comparison of pre- and post-values between groups; (4) comparison of follow-up values between groups; (5) comparison of pre-, post- and follow-up values within each group; (6) comparison of pre-, post- and follow-up values between groups. (f) Results analyzed (R): (T) total antibiotics prescribed/dispensed; (Ga) choice of appropriate antibiotics/adherence to antibiotic guidance according to guideline algorithms, including dosages and routes of administration; (Pa) prescription rate per disease; (At/Bh) attitudes and behavior; (Qph) quality of pharmacy practice. Only two studies [51, 64], evaluated the efficacy of passive interventions in physicians and in one of them interventions was in combination with educational campaigns directed at patients and their caregivers . All the other studies included active interventions in health professionals (whether or not associated with passive interventions). Three studies [22, 46, 66], involved active interventions in patients and health professionals, and in four studies [26, 33, 50, 62] the interventions included improvement of doctor-patient communication skills. Twenty-nine studies (62%) [20–23, 25–27, 29, 34, 36–39, 41, 44, 45, 47–50, 52, 53, 55, 60–65] reported positive results for all outcomes measured; fourteen studies (30%) [24, 31, 32, 35, 40, 42, 43, 46, 51, 54, 57–59, 66] reported positive results for some outcomes, and results that were not statistically influenced by the intervention for others; only four studies [28, 30, 33, 56] failed to report significant post-intervention improvements for all outcomes. While some studies conducted no post-intervention follow-up of participants [20, 21, 23, 25, 26, 29, 30, 32, 34, 36, 38, 39, 41, 43, 44, 46, 47, 54, 57–66], others followed up their participants for different periods, ranging from two months  to three [27, 37, 40, 42, 48–50, 56], six [31, 33, 35, 45, 53], twelve [24, 55] and twenty-four months [28, 52]. Interventions that included improving diagnostic procedures to help physicians distinguish bacterial from viral infections led to very positive results [29, 41, 61, 63, 65]. Whereas most interventions concentrated on physicians (Table 1), some included a multidisciplinary intervention targeting physicians and nurses [68, 70, 76, 79, 92], patients , and in one case, solely pharmacists . Some studies identified the patients targeted, with these being elderly in five instances [68–70, 87, 92, 93] children in three [72, 76, 82]. Table 3 summarizes the studies retrieved containing interventions for improving antibiotic use in hospital care. The diseases targeted were as follows: pneumonia in four cases [68, 75, 80, 93]; urinary infections in two [70, 72]; urinary and upper respiratory tract infections in one ; pneumonia, meningitis and urinary infection in one study , and bronchitis, community acquired pneumonia and chronic obstructive pulmonary disease in other . Of the thirty-one papers, 6 (20%) studied the efficacy/effectiveness of one or more interventions versus no intervention, using a control group [70, 71, 73, 77, 83, 86]. Naughton  compared two strategies, a multidisciplinary intervention in physicians and nurses, and a physician-only intervention in ten skilled nursing facilities randomized into two groups, and reported no statistically significant differences between the two groups. Most of the reported hospital-based interventions coincided with the implementation of protocols or new computer systems, with the result that post-intervention were compared with pre-intervention outcomes without the use of control groups. a In, the follow-up analysis showed sustained adherence to guidelines in hospital-acquired pneumonia but a decrease in guideline adherence in the case of UTI. b In, there was a significant decrease in the proportion of antibiotic orders containing at least one criterion that was not in line with the guideline, but the choice of antibiotics according to the context of acquisition of pneumonia, improvement was not statistically significant. c In, total of antibiotics used was similar but the number of orders placed per antibiotic course decreased post-intervention. d In, there was a significant decrease in use of total and alert antibiotics, except in the case of ceftriaxone and mercapen. f In, there was a reduction in fluorquinolone and cefalosporine but no significant change total of antibiotics neither clindamicine, amoxiciline and co-amoxclav use. (a) Disease: URTI – upper respiratory tract infections; RTI – respiratory tract infections; ARTI – acute respiratory tract infections; UTI – urinary tract infections; COPD-Chronic obstructive pulmonary disease. (f) Results analyzed (R): (T) total antibiotics prescribed/dispensed; (Ga) choice of appropriate antibiotics/adherence to antibiotic guidance according to guideline algorithms, including dosages and routes of administration; (Pa) prescription rate per pathology: (At/Bh) attitudes and behavior; (Qph) quality of pharmacy practice. While some studies [67, 73, 76, 83, 87–89] used passive interventions, all the others used active interventions or passive and active simultaneously. Twenty-four papers (78%) [67, 69–74, 77, 79–92, 95, 96] reported positive results for all outcome measures; 6 papers (20%) [3, 75, 76, 78, 93, 94] reported some outcomes as positive and others as positive statistically non-significant; and Naughton reported negative results . In contrast to primary care in which only three studies [24, 26, 32] analyzed clinical outcomes, in hospital care some studies [67, 69, 70, 72, 74, 81, 84, 86, 96] compared outcomes pre- and post-intervention to assess whether a reduction in antibiotic use might cause clinical alterations, and no influences were observed, namely, to length of hospital stay, and mortality, morbidity and/or readmission rates. Many of the hospital-care studies highlighted the important role of clinical pharmacists in drawing up and implementing guidelines and policies for antibiotic use in hospital settings [3, 67, 69, 74, 75, 77–80, 82, 85, 86, 91, 96]. While 25 papers (53%) [21, 24, 26–28, 30, 35–38, 40, 42–44, 49, 50, 53, 54, 56–59, 62, 63, 65] reported randomized controlled studies in the case of primary care, a far lower number, i.e., 8 (26%) [68, 70, 73, 74, 77, 83, 86, 92], reported this type of study in the case of hospital care, and only one of these included cross-contamination control. Cross-contamination can occur when the participants of different intervention or control groups have close working relationships and might share information about the intervention, and this is important because differences in the results between the intervention and the control group may be influenced by this factor. In some studies physicians participated on a voluntary basis (they were invited to participate in the study), and their prescribing habits recorded during the intervention may not represent their real use of antibiotics [24, 26–30, 33, 37, 50, 61–63, 65, 70]. There were many differences in the analytical approaches adopted by the different studies: while some compared the results of the intervention with the situation at baseline, and some compared the results between groups pre- and post-intervention, others focused exclusively on the position post-intervention. There were few studies that conducted a follow-up after the intervention had ended, and those which did reported that the majority of positive results observed in the post-intervention period were lost over time. No studies were found in which the interventions had been designed on the basis of the attitudes and behavior responsible for antibiotic prescribing or dispensing habits, despite the fact that many authors contend that this knowledge contributes to the success of educational interventions in health professionals [69, 79, 80]. In some studies [28, 33, 49, 79], however, interventions addressed barriers facing the individual prescriber, particularly when it came to dealing with diagnostic uncertainty, and were tailored to: overcoming any identified barriers and enable general practitioners (GPs) to reflect on their own prescribing; helping decrease uncertainty about appropriate disease management and appropriate prescribing; facilitating more patient-centered care; and being beneficial to implementation in practice. 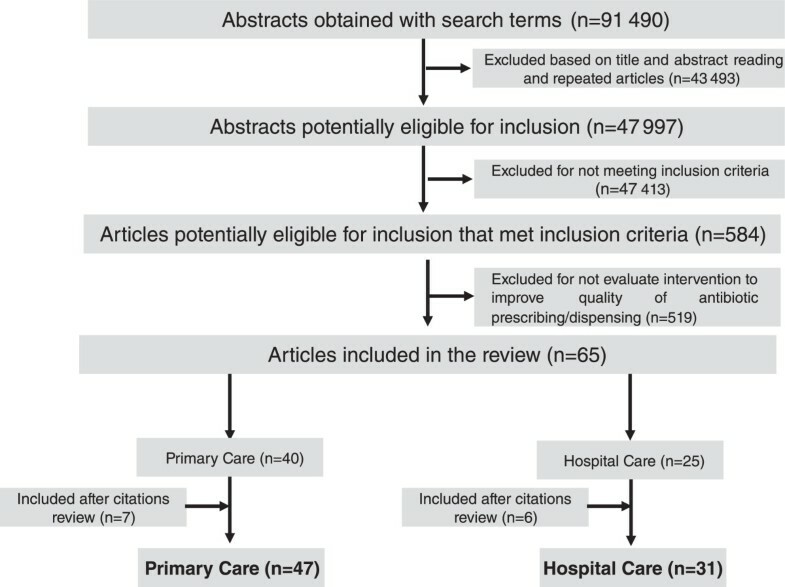 One study  assessed the impact of interventions on the knowledge, beliefs, and decision-making of primary care physicians, and two others, used workshops and focus-group discussions to determine the possible motivating factors underlying observed prescribing practices [49, 62]. The importance of interventions being acceptable to physicians was highlighted by a recent systematic review . All the studies underlined the importance of appropriate use of antibiotics to prevent the problem of microbial resistance, and stated that the most important aim of interventions to improve antibiotic use was to reduce this important public health problem. Even so, only one primary-care  and eight hospital-care studies [67, 84, 85, 87, 89–91, 93] analyzed improvement in bacterial susceptibility during the intervention. While some studies reported the reduction in the cost of antibiotic use, only five studies analyzed the effectiveness of intervention in terms of the cost of the intervention versus the cost of reducing antibiotic use [73, 78, 81, 84, 86, 96]. We found only two studies that addressed interventions (undertaken in Thailand and Vietnam, respectively) [42, 44] specifically designed to improve pharmacists’ to combat the dispensing of antibiotics without prescription, despite there were studies which established that the sale of antibiotics without a prescription are a reality in some European countries [98–102]. Although some of the studies reviewed -mainly those pertaining to hospital care- reported the important role played by pharmacists in developing interventions to be undertaken in physicians and implementing antibiotic treatment guidelines and protocols in hospital settings, there were few studies with interventions targeted at pharmacists. Some authors stressed the usefulness of including pharmacists in teams tasked with drawing up recommendations and making decisions about antibiotic use in certain countries [54, 96, 103, 104]. Results obtained by our search showed that the majority of published studies about educational interventions describe active and multifaceted interventions. This finding is in accordance with a number of systematic meta-analyses of randomized controlled trials to improve health care practice, which conclude that highly interactive learning methods, such as educational outreach visits  workshops [106, 107], small discussion groups [107, 108], individualized training sessions [107, 108], practice-based interventions  and case-based learning , are the most effective strategies. Some recent review papers on interventions to improve antibiotic prescribing [9–11, 97] (Table 4) focus on a limited set of intervention targets, such as acute outpatient infections, and more specifically on clinical knowledge and decision-making processes , specific populations (children), specific diseases (upper respiratory tract infections)  or purpose-designed noneducational (stewardship) interventions in specific hospital divisions, such as critical care  and acute care . One paper  reviewed studies that evaluated GPs’ perceptions about antibiotic prescribing and interventions aimed at prudent prescribing. Our study only analyzed educational interventions but was more extensive, in that it included interventions aimed at physicians and/or pharmacists in both primary-care and hospital settings, and focused on any disease with antibiotic prescribing for child, adult or geriatric patients. In contrast to Steinman , who made a quantitative analyses of quality-improvement strategies, our review, like those of Boonacker , Kaki  and Charani , was a qualitative analysis. To assess the effectiveness of physician-targeted interventions aiming to improve antibiotic prescribing for respiratory tract infections in primary care, and to identify intervention features mostly contributing to intervention success. Studies with an intervention primarily targeted at physicians in a primary care setting aiming to improve antibiotic prescribing for RTIs, conducted in a high-income country, presenting a standardized outcome of (first choice) prescription measured in defined daily dosage, prescription or rates. Systematic review of studies published in MEDLINE, EMBASE, and the Cochrane Library. Quantitative analysis to assess the association between effectiveness rates and intervention features. To assess the effectiveness of antimicrobial prescribing interventions that either alone or in combination, aim to influence behaviors in acute care. Effective Practice and Organization of Care (EPOC) model was adapted to include additional criteria for review of uncontrolled studies. Studies were included only if they were conducted in countries defined as having a developed health care system. Antibiotic prescribing for acute respiratory tract infections in primary care: a systematic review and meta-ethnography. To evaluate general practitioners’ perceptions about antibiotic prescribing, and interventions aimed at prudent prescribing. Studies that used qualitative methods and analysis. Meta-synthesis of qualitative research examining GP attitudes and experiences of antibiotic prescribing, and interventions aimed at more prudent prescribing for ARTI. Impact of antimicrobial stewardship in critical care: a systematic review. To evaluate the evidence for antimicrobial stewardship interventions in the critical care unit. Studies that evaluate the effectiveness of application of any intervention to improve antimicrobial utilization and within an intensive care setting, using a modified Cochrane Registry EPOC Database inclusion criteria. Interventions in health care professionals to improve treatment in children with upper respiratory tract infections. To analyze which strategies are used to promote evidence-based interventions in the management of children with URTI and assess the related effectiveness and costs. Randomized controlled trials, non-randomized controlled trials and controlled before/after studies using implementation methods to change health care professionals’ attitudes to the treatment of children with URTI and investigate the effectiveness of implementation strategies. Systematic review of studies published in Pubmed, Embase and Cochrane Central Register of Controlled Trials. Improving antibiotic selection. A systematic review and quantitative analysis of quality improvement strategies. To assess which interventions are most effective in improving the prescribing of recommended antibiotics for acute outpatient infections. As in the case of any systematic review, ours suffers from the limitation of publication bias. The inclusion criteria allowed for the review to cover a wide range of studies with different designs, something hindered us in making comparisons and performing a meta-analysis. Identification of the design proved a complex task, and it is therefore possible that some study may have been misclassified as regards design, due to an incomplete description of the methodology used. In many cases, deficiencies in the design and description of the intervention and identification of the sample made tabulating the study characteristics difficult. The results yielded by our search show that there are many more papers on educational interventions in physicians than pharmacists. Respiratory disorders were the disease targeted by most studies, mainly in primary care. Published studies varied widely in terms of study design, outcome measures, outcome period, and definition of sample. Most studies used active or a mix of active and passive interventions, and reported that active interventions were more effective. Notwithstanding these heterogeneity, it can be concluded from the above: first, that educational interventions to improve antibiotic use are essential; and second, that in many studies such interventions are active and multifaceted, some of them include both physicians and pharmacists, and were designed taking these health professionals’ attitudes and knowledge into account, in order to focus on the barriers so identified. Authors wish to express their thanks to the Foundation for Science and Technology (Fundação para a Ciência e Tecnologia - FCT), grants [PTDC/SAU-ESA/105530/2008] and [Pest-OE/EGE/UI4056/2014] from the Portuguese Ministry of Science and Education, and to Health Research Fund (Fondo de Investigación Sanitaria) grants [PI081239 and PI09/90609] from the Spanish Ministry of Health. The funders had no role in study design, data collection and analysis, decision to publish or preparation of the manuscript. FR, LB, MTH, AF – concept the study and participated actively in the design of the study. FR and SS – performed the bibliographic search. FR, ATR and SS – extract data from the studies. FR, LB, MTH, AF – interpreted and discuss the data. FR writes the manuscript. All authors read and approved the manuscript.